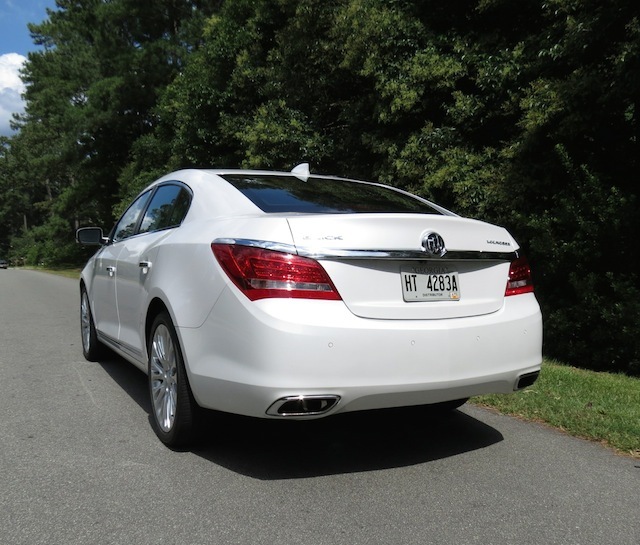 You are here: Home / New Car Reviews / Wouldn’t You Really Rather Have a Buick (LaCrosse)? Buick’s flagship sedan now delivers Wi-Fi and more. Buick calls its LaCrosse a luxury, midsize sedan. Though there is little to dispute the luxury label, calling this sedan “midsize” just doesn’t seem right. Instead, what you have here is a fairly large four-door model that comfortably seats five people and is available with standard front-wheel drive or optional all-wheel drive. I get the midsize label for this model. 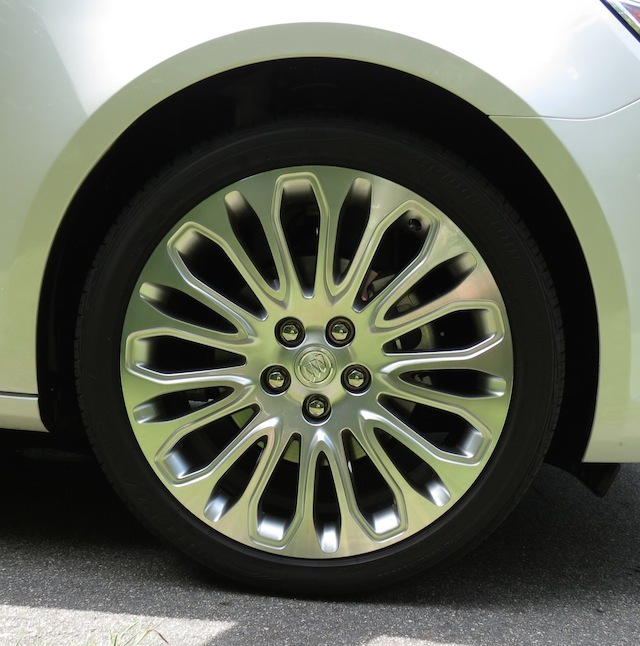 After all, the comparable Audi A6 measures 114.7 inches between the wheels, exactly three inches longer than the Buick. But with shorter overhangs the Audi comes in three inches shorter than the LaCrosse. For Audi, it is the A8 that carries the full-size mantle for this German luxury brand; Buick does not offer an equivalent model. So, midsize it is for the Buick Lacrosse, in spite of its roomy interior. For the second consecutive year I was given the opportunity to drive Buick’s flagship, a LaCrosse Premium I model outfitted with nearly every option available except for all-wheel drive. 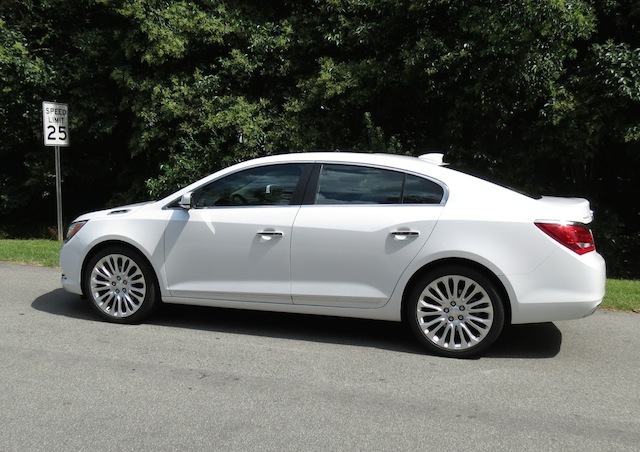 The 2015 Buick LaCrosse is priced from $34,560 and can be had in three more packages: Leather Group ($36,650), Premium I Group ($38,950) and Premium II Group ($40,895). Special white frost tricoat paint ($995), a moonroof with a second row skylight ($1,195) and a pair of driver confidence packages ($2,125 and $1,245) brought the test model’s final price to $46,240. Add in all-wheel drive — available only with the Premium I group — and your sedan is priced from $41,425. Yes, a fully-loaded AWD LaCrosse will cost you nearly $50,000. New for 2015 are several features, the most significant being OnStar with 4G LTE and a standard built-in Wi-Fi hotspot. Yes, this sedan is now a rolling Internet connection, one that makes it possible for multiple devices to connect to and surf the Internet concurrently. Buick notes that 4G comes in 10 times faster than 3G and is also 100 times faster than the previous generation OnStar system. As long as the vehicle is on, the connection is active. A trial subscription is included with your purchase with additional data purchases available thereafter. Other changes for 2015 include three new exterior color choices, four-way adjustable front-seat headrests, infotainment system enhancements and a standard rear view camera system. The 2015 Lacrosse offers a long list of standard equipment to include: remote start, remote keyless entry, power heated side mirrors, a leather-wrapped steering wheel, an electric parking brake, an eight-way power driver’s seat with lumbar support and universal home remote. You also get a six-month OnStar trial subscription, a premium audio system with Buick Intellilink infotainment, eight air bags, stability control, traction control, four-wheel antilock brakes with brake assist and dual automatic climate control. Various package upgrades bring in leather seating, front heated and ventilated seats, push button start, an adjustable front passenger seat, an upgraded suspension system, an electronic limited slip differential, and an 11-speaker Bose audio system. Also available is a 120-volt power outlet, a rear power sunshade, fog lamps, wheel upgrades and a variety of safety features. On the safety front, Buick packages forward collision alert, rear cross traffic alert, a distance sensor indicator and head-up display along with fog lights and adaptive forward headlamps with its Driver Confidence Package #1. To get adaptive cruise control, you need to add in the Driver Confidence Package #2, what brings in front automatic braking. It is doubtful that many customers would stop at package #1 without adding package #2, what provides a measure of automated driving — yes, this sedan truly does come to a full stop when adaptive cruise control is activated, something you can do by pressing a switch on the left side of the steering wheel. Under the hood, you get a choice of a standard 2.4-liter four cylinder engine or a 3.6-liter V-6. Both are mated to a six-speed automatic transmission. The smaller engine is also part of a “mild” hybrid system known as eAssist. With eAssist, a compact electric drive system is integrated with the powertrain “to provide an electric boost” for the sedan. A 15-kilowatt motor replaces the alternator and a 115-volt lithium-ion battery pack is integrated into the trunk. This system enables the LaCrosse to get 25 mpg in the city and 36 mpg on the highway, but it comes at some cost: you get just 182 horsepower to move this sedan and the LaCrosse’s already small cargo space (13.3 cubic feet) is reduced to just 10.8 cubic feet. It was for performance that I was glad a V-6 engine was provided. This 304-horsepower engine is used across a variety of GM applications, including the Cadillac CTS, Chevrolet Camaro and in the GMC Acadia. I am of the mind that a car this size needs a robust V-6 or a four cylinder engine with turbocharging included. That’s not to say that some won’t find the base model appealing, but its detractions seem to cancel the benefits. The driver’s seat is comfortable, supportive and all controls are sensibly placed. I appreciate how the window switches are angled toward the driver and pitch up and forward for easy access. The tilt and telescoping steering wheel, a brightly lit instrument panel and an understandable center stack with an easy to configure Intellilink infotainment system keeps the drama quotient to a minimum. A nicely sculpted cabin, refined materials and special touches such as a slide and lift front center storage compartment shows much attention to detail. On the road, the V-6 delivered copious amounts of power with the transmission shifting seamlessly through each gear. There is some torque under steer present, what causes the sedan to move slightly to the left or to the right during hard acceleration before settling in. That’s a characteristic of larger front-wheel drive models, a problem usually rectified with torque vectoring control. In Buick’s case, they employed a “HiPer Strut” front suspension that limits the problem. Choose the optional Haldex all-wheel drive system and torque steer disappears. 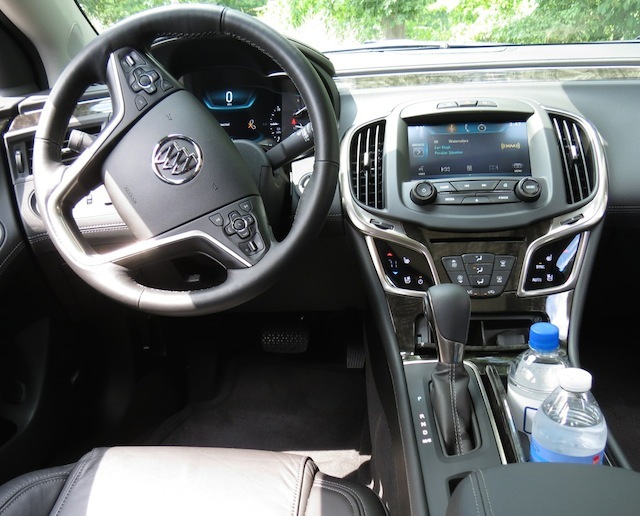 Credit Buick with a quiet interior, for employing methods to keep sounds from entering the cabin, including stopping noises at the source and absorbing other sounds as detected. Buick does this by installing acoustical laminate on the windshield and front side glass, placing baffles in the roof pillars and installing sound deadening and sound absorbing materials throughout. The LaCrosse gets high marks in the all-important noise, vibration and harshness (NVH) classification, something best confirmed when taking to the open road. There are a few things about the LaCrosse I would like to see changed. First, add a docking port for a smartphone that goes beyond the tray found within the covered center storage compartment (the tray itself should be enlarged for smartphone purposes). It could be placed just fore of the concealed cup holder compartment, provided that the compartment is moved aft by one inch. Second, the rear doors have the tiniest of storage compartments and no room to hold water bottles. 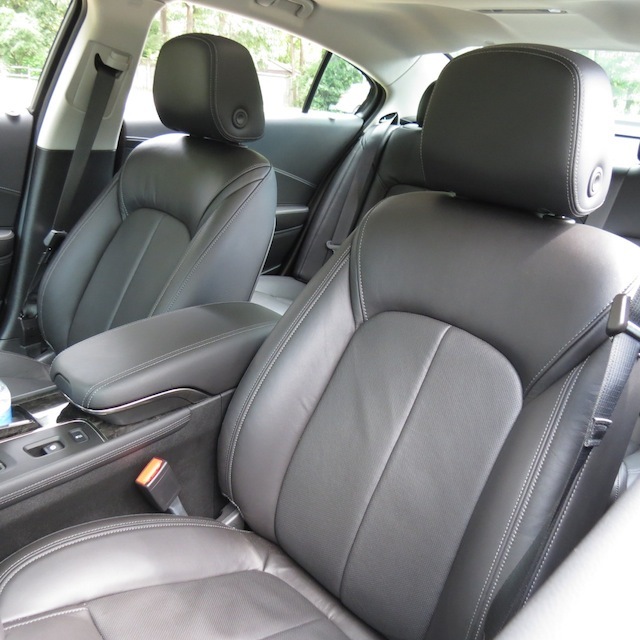 Sure, there is a center seat folding arm rest that reveals a pair of cup holders as well as an eyeglasses holder, but that means taking space away that should go for seating a fifth passenger. The more drink holders in today’s vehicles that are not crossovers, the better. A few of the smaller, yet important features of this car include: LED interior lighting, rear seat apparel hooks, trunk grocery netting and dual exhaust finishers. Not to be forgotten is the sheer moonroof cover, what raises interior brightness without direct sunlight penetrating the cabin. 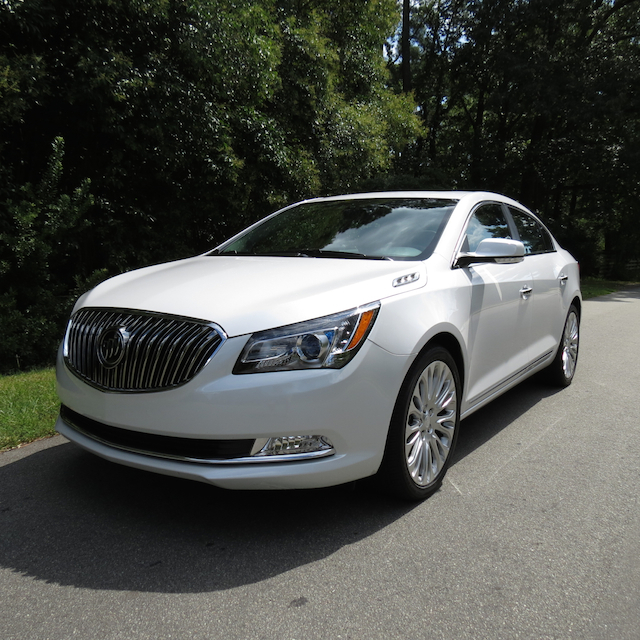 2015 Buick LaCrosse Premium photos copyright Auto Trends Magazine. All rights reserved.